1 of 1 Trim rounded top and brown sides from poundcake. Slice into 4 equal slices lengthwise. Broil 2 to 3 minutes, turning over once. Spread each slice with 2 tablespoons seedless raspberry jam. 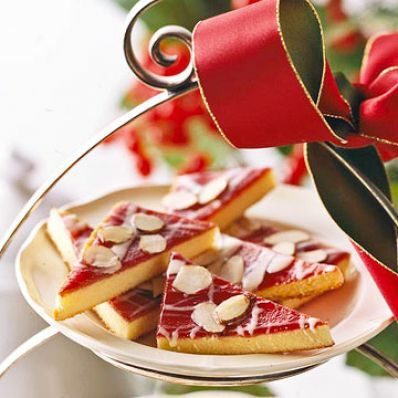 Drizzle each slice with 2 ounces melted white chocolate; top each slice with 2 tablespoons sliced almonds, scattering evenly. Cut each slice into thirds, then each third in half diagonally. Makes 24 points.